Pakistan’s top diplomat here today escaped unhurt in a powerful explosion triggered by the LTTE, believed to be angry over Islamabad’s arms support to Sri Lanka, killing seven persons and wounding eight others. At least 43 schoolgirls were killed in Sri Lanka’s rebel-held Mullaitivu district today and dozens more hurt when air force jets bombed an orphanage. Should Dean Jones be banned from cricket commentary? 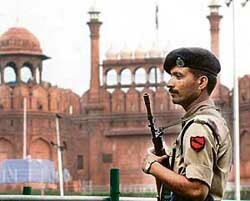 Delhi was today brought under a thick blanket of security with sharpshooters deployed around key installations in the run-up to the Independence Day. As India moves into the sixtieth year of its Independence, it is finding itself adrift, aimless and almost rudderless. So caught up the nation is with the immediate, it is fast losing its ability to look ahead. A peculiar kind of anxiety is blocking its view of a future that should rightly belong to over a billion people. While Chief Minister Ghulam Nabi Azad has prematurely retired 10 government officials against whom there were allegations of corruption, a food scam worth over Rs.3.50 crore has rocked his home district of Doda. An arrested Lashkar-e-Toiba (LeT) militant, Anas, alias Rizwan, has admitted that he had been in constant touch with officials of the ISI and the Pakistan Army. Kashmir appeared to be foremost in the minds of the alleged plotters of the unsuccessful bid to blow up the US-bound flights in Britain with liquid explosives, media reports said.